[Company Name] no longer wants to rely solely on paid traffic to drive leads, and decides to invest into an organic content marketing strategy. This often starts with a blog, a few unresearched ideas, and a terrible assumption that their audience will be interested in anything they talk about. First off, blogging in itself isn’t a content strategy; it’s just blogging. And while blogging is an extremely powerful tool when done correctly, we see way too many businesses focused on churning out quick, worthless content for weeks, months or even years, and then getting frustrated that the desired results didn’t come. How to get people to read your blog requires research, attention to detail, technical optimization, and a deep understanding of who your audience is, and what they care about. Just like other areas of content marketing, blogging needs to follow a plan. A well thought-out blog strategy can lead to some incredible results. According to HubSpot, B2B marketers that use blogs receive 67% more leads, are 13x more likely to achieve positive ROI, and receive 97% more links, than those who do not blog. In this first post of our Content Marketing 101 series, we’ll cover 5 effective ways how to drive traffic to your blog. The first and most important step of getting traffic to your blog is resisting the urge to write on assumptions or personal interests. In depth keyword research is required to understand the different ways people search for your product or service. Some people might be asking questions about a problem that your software solves e.g. “how to decrease web support costs” or “how to automate website support”, while others are looking directly for your product name e.g. “best helpdesk software”. Depending on where they are in the customer journey, there is sure to be several different ways your future customers are searching. There are many great SEO keyword tools available, a good free one being the Adwords Keyword Planner. You’ll want to use a tool that provides search volume, as you wouldn’t want to write a blog post around a topic that has little to no search as that would be a waste of your efforts, which is something we see far too often. Keyword research will show you what your audience is actively searching for, and your posts should be based around your findings. 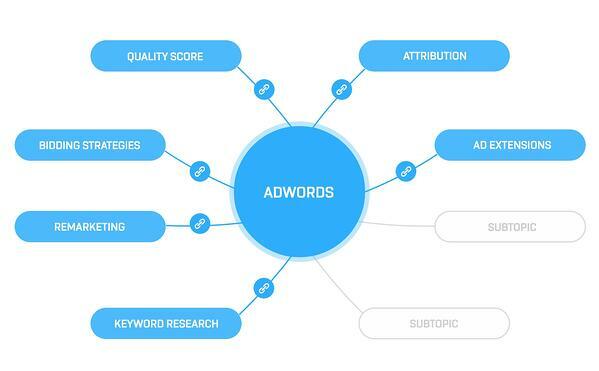 You’ll also want to consider how competitive each keyword target is, in comparison with your sites authority. Have you been around for a long time, and have hundreds or thousands of quality links? Or are you a new website? If you’re just starting out, you’ll be better off targeting less competitive keywords. Organize all of that data into core topics and subtopics. If possible, include the search volume potential per group so that you can get an idea of the results you can expect. 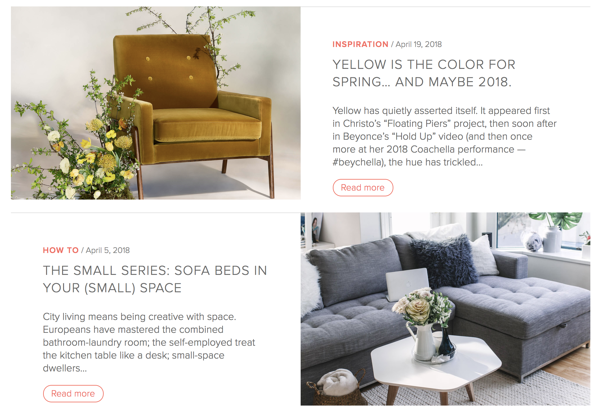 Typically you will create an information-rich landing page for each core topic (aka the Pillar page), and then you can start to build subtopics (Clusters) out with supporting articles and blog posts. Each post should cover specific aspects of the overarching topic, and link to the main Pillar page so that search engines will see it as a tightly themed topic, and where relevant, link back to each article from the main Pillar page. This will create multiple entrance points for visitors to find you, and create a strong connection between all of your posts around a topic category. HubSpot’s content strategy tool is a great resource for this, but if it’s too pricey for you, there are other good alternatives such as MindMeister or even Google Docs. CTA effectiveness: Do people who land on this page convert? Let’s dive deeper into a few of these. Google Analytics is a free, mainstream tool that can help us understand which content and blog posts are resonating the best with our audience. Go to Behaviour > Content > All Pages and enter your core topic category into the filter. In the example below, we’ve entered “saas” because we want to see performance metrics on all of our SaaS blog posts for the previous month. We can see how many visits each post has received in the last month, the average time on page, entrances, and bounce rate. Entrances is an important metric as this indicates that you have good ranking for the keyword/topic the post is targeting. While we always want low bounce rates, it’s okay if these are lower for blog posts, as long as the average time on page is good, you know your readers are enjoying the content! We can see that one blog post is responsible for the large majority of the traffic, while the others aren’t doing so hot. This is okay! It can take time to find the sweet spots, but once you discover them, be sure to create more content around them. This is the fastest, cheapest way possible that we know of to test interest for a post topic. Facebook has powerful targeting options that let you choose your audience by age, interests, demographics, geographics, and so on, so that you can feel confident you’re putting your content in front of the right crowd. Our tip here is to measure as quickly as possible. For example, don’t have a set budget to boost a post. Try boosting it on Facebook as fast as possible until you have the results you need to see if people care about it or not. It shouldn’t take more than $10-$20 to determine if it’s something people care about. If the CTR% is poor, move on to the next idea. If the response is positive, dive deeper into this topic idea and look at ways you can improve and even re-use it. 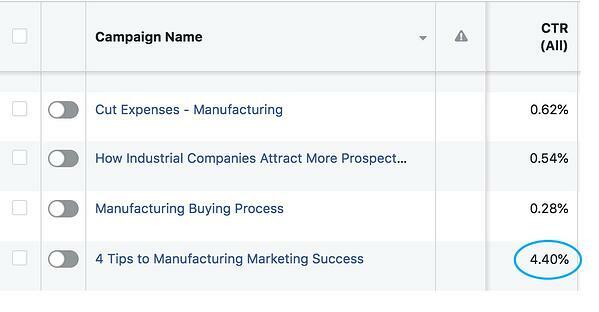 In the example below, we’re targeting individuals who own manufacturing businesses, or work in the marketing department of manufacturing companies, and who live in Canada or the United States. We tested 4 different posts, with different headlines within a week and quickly learned that one direction greatly outperformed the rest. This type of testing saves time and money, and provides huge insights into what your audience wants. If you have defined categories, you’ll be quicker to learn which ones perform the best. It will also make it easier to manage consistency once you have several different contributors. You’re working hard to grow your blog, and having structures in place will allow you to scale smoothly. Article.com does a great job of this, breaking their post types into “inspiration”, “how to” and “life at article”. This way, blog visitors get a clear idea of what a post will be about before they click in to read. Oh, you did your keyword research, wrote your post, and thought you were done? If only it was that easy. SEO for blog posts needs to be tested, similar to your regular website pages. So how do you know if your SEO is good or needs to be adjusted? The approach can depend on which tools you are using. We’ll dive deeper below with one paid tool, as well as one free one. Many paid tools will show you rankings for your blog posts, as well as the keywords that it’s ranking for. I should mention that we’ve tried several over the years, and no tool is perfect. It’s best to view the data comparatively, and generalize the data. 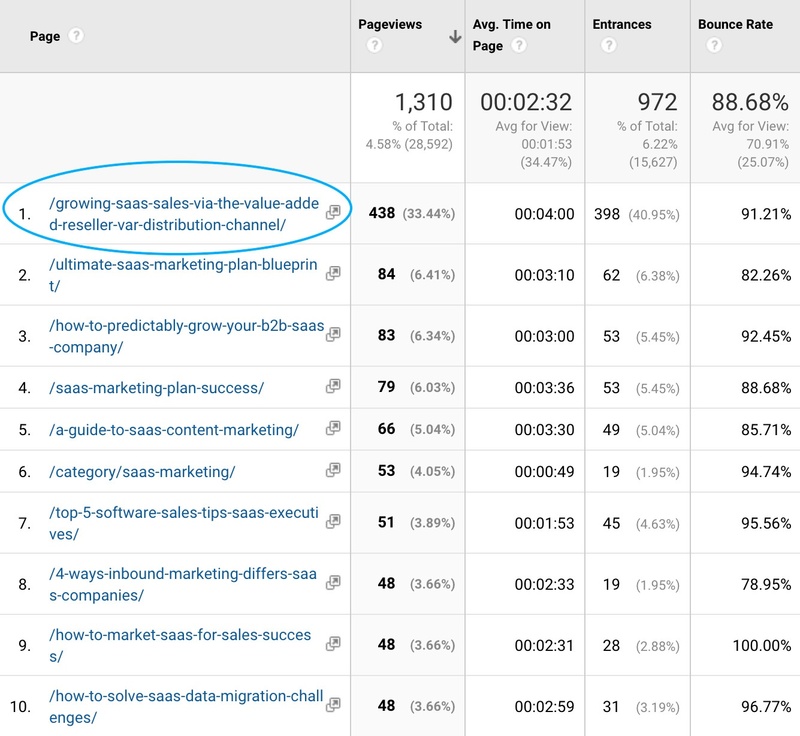 In the screenshot below, we’re viewing data on some of our “SaaS Marketing” blog posts with SEMrush. 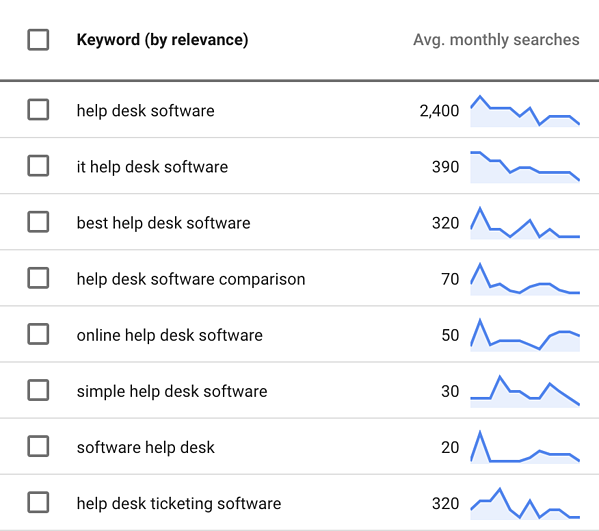 We can get some insights into which keywords each post is ranking for, the average position each page shows up for, and the total volume of the keyword. What we’re looking for here are for posts that have volume potential, and are ranking on the 2nd or 3rd page. This is the low hanging fruit, as focusing on improving the SEO and rankings slightly on these posts should quickly lead to an increase in blog traffic. A great free resource for optimizing your blog posts SEO is Google Webmaster Tools. There are a lot of settings to play around with here, but for testing your blog posts SEO, select “pages” and make sure the impressions and position columns are all active. Use the pages filter to view posts on a specific topic. In our example below, we’re viewing our SaaS Marketing posts. 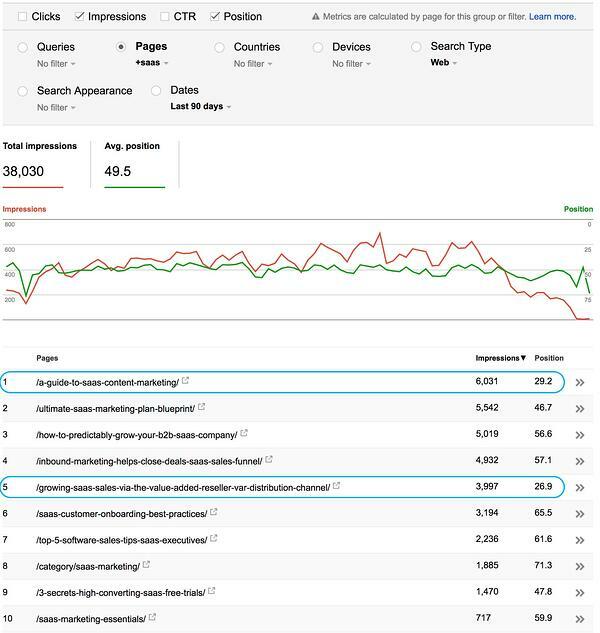 Similar to what we did in the previous example, we’re looking for pages that are generating a high amount of impressions, and have a position on pages 2-3. It might be easier to sort by the impressions or position column, depending on how many posts you have. In the example below, we can see there are 2 posts that are generating a ton of impressions, but have 3rd page positions. This makes it clear which pages we need to work hard on optimizing, and we can be confident that improving our rankings for these 2 pages will lead to a lot of traffic! Fact: There are a lot of blogs on the internet. There’s really no point writing about something that’s been written about 100 times already. B2B content marketing is not about frequency, it’s about quality. You could write 500 articles in a year, and have 90% of your traffic come from 2 articles that people care about (just like our SaaS example above!). Don’t fall back on excuses, stand up and demonstrate your leadership. Even if it takes you the entire month, write that one quality post that will offer your visitors value. And that concludes our guide on how to get traffic to your blog. Follow these 5 steps and watch your traffic explode! If you have any questions or need a hand, feel free to reach out!